Global Setting is one of the various setting function in Chronos eStockCard warehouse system to make user more experience to control the data in eStockCard. Currently, Only English Language is available on eStockCard. Once other language are available, user can set the eStockCard default interface language from this panel. User can set default Currency to use in eStockCard. If the default currency is the same with the PC regional setting just tick ‘Use regional Setting (Follow Computer)’ Check box. Else , just untick the checkbox and select respective default currency manually from combo box. This setting function will give user an option to set the default tax scheme to use in Sales Quotation Screen or Sales Order Screen. However user also able to choose another tax scheme during Sales Quotation or Sales Order process. Number formatting setting option is enable user to set the default decimal place to be use on number datatype in eStockCard. Currency formatting setting option is enable user to set default decimal place to be use on Currency Datatype in eStockCard. User can choose either to use ”Default’ or ‘Attach Item Category Prefix’ option to be used during generating serial no process. User can select a default barcode printer to be used in eStockCard by using this setting option.Please make sure barcode printer was installed in to the PC before perform this option. 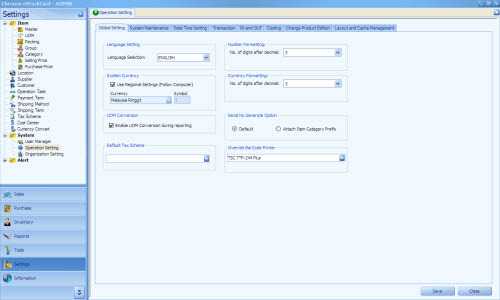 Once done the setting in Global Setting Screen, user must save the process. The change that user made should be effective automatically.